(Stoddard) It isn’t unusual for people in their twenties to go through a series of jobs, or to have multiple jobs before they land a position that is satisfying and actually pays a wage to cover their living expenses. Still, coming up during a recession in a state with limited employment options made job hunting for young adults in Vermont difficult. Katie Sullivan, who is 28, says she’s seen many of her contemporaries try to make a go of it here. And fail. (Sullivan) "People came to Burlington after college or stayed there after graduating UVM because they loved the city or loved the state. And they worked as baristas for two years with their degrees and looked for jobs that could employ them using their knowledge and education. They couldn’t get any jobs and after year three, they give up and say, ‘I’m going to go back to New Jersey or Connecticut, a place with entry level opportunities’ – more growth than they leave. And I think that’s what the exodus from Vermont is looking like, that Vermonters and visitors alike are doing that." (Stoddard) In a stagnant economy, older adults with experience are taking positions that traditionally would have gone to young people. And older workers are staying in jobs longer, limiting room for new employees. Twenty-five-year-old Anna Hill found it much harder to find a job than she ever imagined. (Hill) "I feel like a lot of entry level jobs that are being advertised, people are applying for them that are overqualified because the job market is so bad. So that would be like, one of our friends who recently graduated and don’t have a lot of experience going up against somebody who has a bunch and is just trying to get a job." (Stoddard) Karen Madden, director of Academic Support Services, hasn’t seen employment this difficult for recent grads in her 20 years at Johnson State College. (Madden) "The job market is so tough. You have 40-50 people applying for a position [that is] relatively low-paying. And so you’ve got people working in jobs that teenagers and college graduates would get in their 40’s and 50’s. There’s not a lot of turnover." (Stoddard) Some college graduates find they need to leave Vermont to find a job in their chosen field. Others find they need to work somewhere else to build experience that will help them land a job back in Vermont. And still other young people who are building lives here find they have to juggle several jobs at a time to stay afloat. 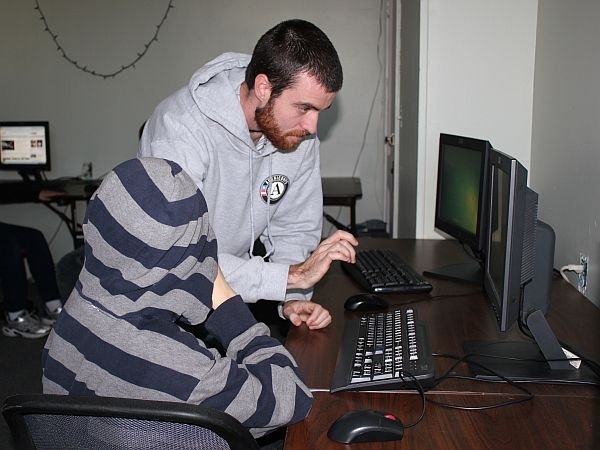 Mischa Tourin and Johnny Powell are AmeriCorps volunteers at the Essex Teen Center, but both have other jobs to help make ends meet. (Tourin) "The whole time that I’m here in Vermont, I’m working two or three jobs to get by. And it might be a full-time and a part-time restaurant job and another job just when there is special events. But it seems that all the 20-year-olds are working beyond what seems reasonable." (Powell) "Oh yeah. I get $25 mowing a lawn, $50 playing music at the farmer’s market, probably here and there I make $10 off booking a show. I can’t just do one job, even if it’s $25 here, $50 there. It’s more out of a necessity – that pays for a week’s worth of gas." (Stoddard) Jesse Ross has also experienced challenges He’s a 25-year-old mechanic originally from Springfield, who’s seen his hours cut back. That forced him to start up a side business mowing lawns. (Ross) "In 2004, I found a new job, it was a lot more pay than it was before. But in 2009, they cut my wages back, so for two years or so I had to work 30 hours a week, versus 40 hours a week. So in that two years I had to create my own business to kind of make up for that lost money. I’m now working for the State Police full-time and [I have the] landscape business on the side. And I’m busier than ever. Which is good, though. I like that though." (Stoddard) Ross is now working full-time for the State Police as an auto mechanic. Expectations are high in a generation told by hopeful parents and teachers that they could pursue their passions. (Francis) "I think our generation especially has been raised to believe you can do anything you want to do. In reality you can, but I’ve never been rejected as many times as I got rejected in the six months of desperately searching to find anything." (Francis) "It wasn’t what I went to school for. It was a great opportunity to grow as a person. And amount that I learned in the year that I’ve been there is truly amazing." (Heaps) "Young people can take chances that somebody 45 and 50 with a young family can’t take. They start a business in their garage. And of course most of them fail, all the time. But some do succeed. The growth of an economy, as we found out, depends not on the large companies, not on small companies – as booth those groups will argue. But on a select few of start-up companies that hit it and get big and grow. And so, we want a pool of young people to do that. And in Vermont, we see that pool of people decreasing and that part is particularly worrisome." 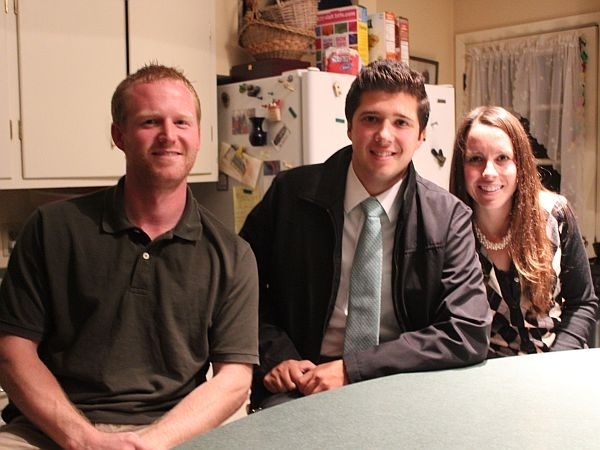 (Stoddard) Twenty-four-year-old Dana Bingham is working with her boyfriend and another friend to help buck that trend. They’ve started a property management and contracting company. (Bingham) "You know, we go to our jobs for nine or ten hours a day, we until 11, 12 o’clock at night on starting our own company. I think that our generation just wants something different." 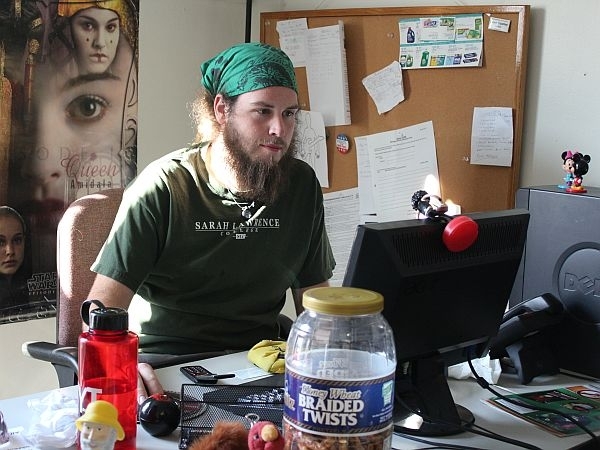 (Stoddard) Bingham’s boyfriend, 27-year-old Patrick Biddiscombe, is inspired by Vermont’s great, entrepreneurial examples. (Biddiscombe) "I think you have to be creative to be successful in Vermont. If you look at people who can financially live the way they want to, a lot of them are entrepreneurs. They started Magic Hat or Seventh Generation or Burton. It’s a culture in Vermont that says, ‘ok, yeah – it’s risk. But a lot of people around you are doing it. So, here’s a little incubator town for startups." (Stoddard) This couple is among many in this generation who are pushing new ways to conduct business, and to balance personal life and work. Biddiscombe, who has an MBA from UVM, explains. (Biddiscombe) "We’re the ‘perks generation.’ It’s more about the atmosphere provided and the different benefits you can get. Maybe we’ll work longer hours, but give us some down time in the middle of the day. I see that being more sought after more than the highest salary. It’s a new model that’s definitely hit Burlington. Burlington is a very creative business marketplace. I that a lot of companies are trying to create a new, modern workplace." (Stoddard) Bingham says more companies are going to have to figure out the importance of this new approach. (Bingham) "They’re going to have to completely revolutionize the way that their businesses run. The company I work for, they have a very older generation, a very different style. I think if you look at the companies that are being very successful, you see the Dealer.coms where you get to go in and have a free massage, or workout in the gym." (Biddiscombe) "And I think these people work hard – I don’t want to downplay it in any." (Stoddard) Steve Shepard is a business consultant who has studied the needs and interests of this generation. He thinks smart business will adapt. (Shepard) "The fact is all the rules are changing. And we would be best served if we paid attention and adapted to these rules, and really listened to these kids because they are bringing in whole new ways of thinking about things that frankly we haven’t done in a hundred years. Remember that the skill that they bring is the skill of the group. It’s quite common to have millennial employee go to their boss and say, ‘this job that you’ve given me – this task – is great. And I can do it. But I have a friend at another company who’s a real expert at this stuff and I’d like to bring him to ask his opinion, because I think he can add value. And that concept, which we tend to look at as the possibility of escape of intellectual property, is not that at all. It’s actually a very good thing. You’re going to see a lot of knowledge sharing thing going on as way to enrich your company and enrich your offerings, as so on." (Stoddard) Shepard also believes technology plays a growing and important role in shaping a work environment that’s appealing to younger workers. Among the changes technology has brought to the modern workplace is that many jobs no longer rely on location; employees can work anywhere. Technology is creating a cultural shift where loyalty to place can be and is becoming a greater value than loyalty to a company. Shepard says Vermont has an advantage in this new, more flexible workplace, as long as there is the technological infrastructure available to support the shift. (Shepard) "The lack of technology is a serious, serious issue, because of the fact that no technology means that this is an irrelevant place to live. If I can’t get connected here, I’ll go somewhere where I can be connected because connectivity is part of my life. It’s air — if I don’t have that, I can’t live So we need to accelerate that I know there are things going on within the state, but we have to do it faster, we need to do it more effectively. With an absolute focus on the fact that this is not just about getting access to the internet, this is about getting people access to their own futures. And if we don’t do that we are limiting our access to a cohort of people who are truly and honestly going to change the world." (Stoddard) The tone of last fall’s Tech Jam Job fair in Burlington, which has doubled in size in just two years, was decidedly upbeat. Hawking his web site at the Tech Jam, Jeremy Haskell from JobsinVT.com is optimistic"
(Haskell) "As recently as this year, we’ve seen about a thousand jobs increase, year over year. So employment is coming back. As folks went to a lean kind of model and they’re looking for digitalized employees, I think they’re going to come back to that human element that’s so important for business in Vermont. Obviously technology is a huge and growing sector here in the state. There’s always the hospitality and tourism, which is going to be central to Vermont. And there’s a lot of great opportunity. That’s very important. There’s definitely a lot of great talent here in Vermont. I don’t think there’s any reason why we won’t make a full and robust recovery." (Stoddard) Beyond cutting-edge technology is good, old fashioned technical training. Some of today’s youth say what they learned in high school has made a real difference in their careers. Corey Kennedy is working with his friends at their property management and contracting company. (Kennedy) "Personally, I went to vocational center in my last two years of high school. I was able to go out within different companies and do externships throughout school and talk to other professionals. I felt that was very beneficial for me. That’s the way I learn. It was nice to go out to these local companies, but it didn’t seem like, ‘these are the companies you should stay with.’ Or that you should at least be interested in. It was still, these are the skill sets we would like to provide for you when you leave the program. But still, there could be a little more focus on how great Vermont is and what Vermont has to offer." (Stoddard) Still, Kennedy and many in his generation are finding ways to make a life for themselves in the place where they want to live – even if it requires more effort than some of them think it should.